The NASCAR Sprint Cup and Camping World Truck Series will gather for a doubleheader showing at Martinsville Speedway this weekend. Check out the full schedule below. The Xfinity Series is off and will return to action on November 5th at the Texas Motor Speedway. The Goody’s Fast Relief 500 Race Weekend is October 28-30; the weekend starts on Friday with Virginia Lottery Pole Day and continues on Saturday with the Texas Roadhouse 200 presented by Alpha Energy Solutions NASCAR Camping World Truck Series Race. The NASCAR Sprint Cup Series is in action Sunday with the Goody’s Fast Relief 500. The half-mile speedway offers great views of the entire track from nearly every seat, and every seat has a view of the action on pit road. 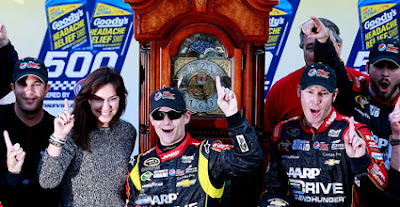 Last year, Jeff Gordon took home his ninth grandfather clock trophy and was the first driver to clinch a spot in the Championship Round of the Chase for the NASCAR Sprint Cup. The Goody’s Fast Relief 500 is the first race in the Round of 8 of the Chase.